'Sins Of Greed', the fourth album from American rockers Madman's Lullaby, would have been right at home on a music store shelf in 1988 because it's retro Hair Metal to the max! This band have a rambunctious old-school Hair Metal sound and attitude that's full of energy, loud guitars and sharp vocals. It really could have come straight out of the eighties LA Strip Rock scene. Although these guys create a style of music which I thoroughly enjoy, I didn't find myself really taking to these songs and I found very little to enthuse about. It's not bad, far from it, and the musicianship is exemplary, but none of the songs reach out and grab me and thus get me invested in them. They have the style and energy that emulate the golden era of LA Strip bands, but without the choruses or hooks to compliment that, it feels a little mediocre and ultimately forgettable. If there had been just one radio-friendly chorus amongst them, I think the album may have charmed me more, but it all seems to fall flat when it comes to the choruses and there are no other major hooks which keep you interested. It's not a very commercial album at all, but I do feel the average Hair Metal fan will find a lot to enjoy on this release, while guitar-orientated fans will appreciate it more than the average rocker as they will be drawn to some great guitar riffs and killer guitar hooks like the one featured in 'Don't Walk Away'. I think guitar fans will have a deeper appreciation for the instrumentation side of the songs and the lack of commerciality will be less important to their listening pleasure. 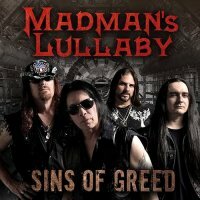 Madman's Lullaby have a really defined sound and I fear that goes against them creatively as I found the songs lacked individuality and many of them had a similar feel. On the positive side, they embody the genre's core rules – it's all rambunctious, energetic and rebellious – so if bands like Hanoi Rocks and Mötley Crüe stroke you the right way, there's a good chance you'll dig this album far more than I do. I can't really rave about 'Sins Of Greed' but genre fans should certainly give it a chance as the retro sound will definitely appeal to anyone who believes anything released after 1991 is rubbish!